A large multinational credit agency with 400 million credit holders worldwide. Several years ago, this Fortune 500 financial services company implemented an Electronic Invoice Presentment and Payment (EIPP) portal hosted by an outsourced service provider to deliver an electronic invoicing option to their business customers. After years of continuous effort, only about 10 percent of their largest active monthly invoice customers had transitioned to the paperless system. Then, our customer learned that their portal service provider would be going out of business in six months. The system had not attracted the number of users they had originally projected. While 10 percent was better than none, the costs of printed invoices plus the lack of flexibility in messaging through printed documents were strong reasons to get their clients on the electronic system. Their largest customers needed functionality such as sub-account and cost center subsets and specialized data extracts that the outsourced application did not offer. The majority of the company’s customers, both portal and print, had indicated a preference for an email-based, push-delivered solution, which their current vendor’s technology did not support. After evaluating several alternatives, our customer chose CEDAR Document Technologies to deliver the complete EIPP solution they needed. The new EIPP portal had to provide a cost-effective way to deliver on a backlog of customer requests (such as XML data extracts, credit card payment, and special user workflow rules). Our customer wanted to be able to give their customers the option of choosing to receive invoices in whatever way they preferred: print, secure, interactive PDF, or through a portal. They wanted to be able to provide on-demand electronic access to all historical documents to facilitate more efficient, more effective customer service and support. The short time frame for transitioning to a new solution was another challenge. Our customer couldn’t afford a glitch: When their current supplier shut down they had to be sure that the new system was up, working properly, and seamlessly delivering invoices to their clients. A technologically advanced EIPP Web portal. Based on CEDAR’s support Web services framework, the portal provides invoice summary and PDF at the company, cost center, and sub-account level; line item dispute management; ACH payment with user self-administration; invoice review, approval, and payment workflow; and company Statement of Account reporting, including information such as accounts outstanding, invoiced amount, and past due accounts. Mapping of the existing print data feed to support CSV and XML data extracts. This allowed our customer to integrate visibility and management of both electronic and print-delivered invoicing into a single system for greater accountability and control while offering their customers a variety of data extract formats for reconciliation and review purposes. Interactive PDF invoices. Our customer gained the ability to create and deliver invoices via email as secure, interactive PDFs. This invoice delivery vehicle provided customers with flexible ACH and credit card payment options, as well as line item dispute, customer service contact, and real-time Statement of Account updates – all from within the electronic invoice. Web-based archiving for all AR staff and customers. Through CEDAR’s Web portal administration tools, our customer gained the visibility and control to define all their business rules, workflows, and user rights. These tools improved the company’s insight into their invoicing and A/R functions and extended the features they could provide their clients. After rigorous protesting, CEDAR went live with the new portal application seamlessly and on schedule the same evening the previous vendor sunset their application. Once deployed, CEDAR immediately began delivering invoices, processing payments, handling disputes, and gathering analytical data. 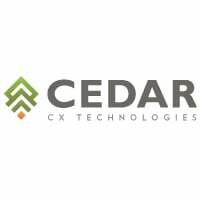 Four months later, CEDAR rolled out a secure, interactive PDF invoice and began supporting the conversion of customers from portal or paper to their preferred delivery solution. 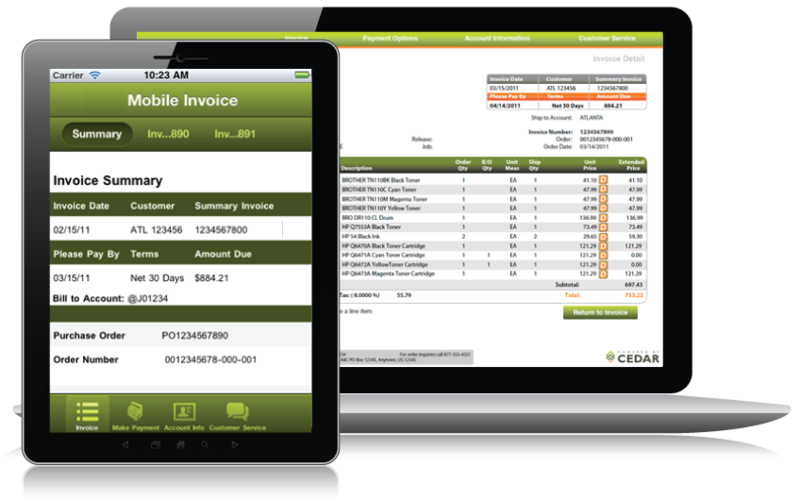 Today, 60 percent of the company’s active customers are completely paperless through CEDAR’s solution. And an impressive 2/3 of clients using electronic invoicing do so using the email-delivered interactive PDF option, compared with the 1/3 who pay via the CEDAR-based portal.